Into The Deep: How do I read the Bible? I meet tens of thousands of people a year at different events. Most of them are Catholic Christians who want to start reading the Bible but don't know where to start. So if you've ever wanted to go deeper into God's Word but haven't known how to approach it, allow me to suggest a few tips (so you can learn from my mistakes). Like anything else, if you want to build something … in this case, your knowledge and love for the Scriptures … you don't just grab a hammer and some nails and start pounding. To ensure that you don't just jump in and then quit out of frustration or confusion, there are certain things you can do to be more successful. We'll attack this on three levels … the tools, the blueprint and the construction. By the end you'll have ten total steps to help you build your bodily temple into a Biblical fortress, able to resist anything the devil can throw at you. Let's start with three things you should do before you start studying. 1. Pick a time, but not just any time. Commit to a daily time that you'll open God's Word but be sure it's an intelligent time. If you're really tired, for example, than reading the Bible once you're in bed probably isn't the best time. Pick a time when you're totally awake so you can give your full attention. 2. Pick a Bible that you can understand. Get yourself a good Catholic Bible (that way you have all 73 books), but if you don't have one right now, that shouldn't keep you from reading. The best translation today is the one that you already have. It's important that your Bible is comfortable to read, light enough to take with you, durable enough to really use, and inexpensive enough that you don't feel bad writing or marking in it. If you haven't seen it … I highly recommend the Life Teen Catholic Teen Bible. Remember, your Bible is meant to be used. 3. Have other books that help you understand the BOOK. There are some great resources out there designed to help you understand the Bible better.You Can Understand the Bible by Peter Kreeft is a great resource, as is the Ignatius Bible Study series by Scott Hahn and Curtis Mitch. There are other resources like Sword of the Spirit that highlight specific books (like St. Paul's epistles, in this case) as well as Finding Yourself in Scripture. It's also great to have The Catechism of the Catholic Church handy, so you can use it as you study. Next, we'll cover three things you can do as you study. 1. Pray, and then pray some more. Before you open God's Word, ask the author of that word – the Holy Spirit – to be present in a bold and fierce way. Quiet yourself, spend some time in silence, and hold the Bible in your hands as you pray. Ask God, through the power of His Spirit, to open your mind, your eyes and your heart to His truth. Thank Him for the gift of His Word, a gift that millions have given their lives to defend and offer you the freedom to read and pray. It doesn't have to be a long prayer but take some time … this is the most important step in Bible study. 2. Have a plan. If you were planning on reading the Bible cover to cover … don't. The Bible isn't a novel; it wasn't designed to be read from Genesis straight through to Revelation. After you have studied it for a while, if you want to go back and read it cover to cover, go for it. Until then you'd be wise to attack it from a different angle. Pick one book that you are going to start in and make that book your focus for a while. If you are starting from scratch, I'd suggest the Gospel of Mark. St. Mark's gospel is the shortest and easiest to understand. 3. Get the background. If you do start in a Gospel, take the time to learn about who the author was, who he was writing to, and what the basic themes are of his Gospel account. Ask yourself what makes that specific account different than the other three. Don't just jump into a letter of St. Paul without knowing what is going on in the city to which he is writing. If you are reading a prophet, know what was going on in his world at the time. 'Where do I learn these things?' you might ask. Read the Introduction to the Gospel on the pages preceding it. Use one of your additional books or resources to help you. When you know what is going on with the author and the audience, the words will jump out at you in a much different way and you will have a far greater insight. Finally, let's hit four things you should remember, while reading the Bible and beyond. 1. Less is more. Don't just open up the Gospel and read until you get tired or 'for fifteen minutes' because that's what you committed to doing. Most Bibles break down the chapters into subchapters. If you began in the Gospel of Mark, for instance, you shouldn't just start in verse 1 and continue through verse 45 (the end of the chapter). Instead, take verses 1-8 and spend 15 minutes meditating on them. Take just verses 9-11 and ruminate (chew) through them. That first chapter (the 45 verses) should be broken down into about 10 different studies alone. Studying the Scriptures is not like driving across country … it's not about how much distance you cover in a set amount of time. Enjoy the time, roll down the windows and take everything in. 2. Periods are there for a reason. The periods at the end of each sentence are almost as much a gift as the words that precede them. Each little 'dot' is an invitation to take a breath and reflect on what you just read and prayed. At each period, take a moment to envision the story that's unfolding. If you are reading about the Baptism of Jesus (Mk. 1:9-11), don't just say 'Hey cool, Jesus is getting baptized.' Go deeper. At each period, put yourself more deeply into the story … at His baptism, where are you? Are you on the shore, on the mountain overlooking the scene or in the water right next to Christ? Is it hot out? Does the water smell bad? Is it noisy or peaceful? Let the story come alive. 3. Journal. As you are writing and verses confuse you or questions arise, write them down in a journal. Don't allow yourself to get hung up on 'tough verses.' Scribble down the verse number with a question mark and keep moving. Later on you can search the footnotes, other books, this website or just ask someone knowledgeable in the Bible for more help. The journal isn't just for questions, though. You should also use it to write out reflections that the verses stir within you. Write down images God gives you in your imagination. Record key verses that stand out to you spiritually. God will reveal a great deal about yourself to you when you let Him. 4. Put the Book down. Don't become a Bookworm, who never takes their eyes off of the page. The Bible is the Living Word (Jn. 1:1-5, Heb. 4:12). It lives and breathes well beyond the page that contains it. Share what you learn. Write out passages and post them up in your room, locker or office. Email verses to people. Put them on the fridge. Just like the Eucharist, the Word should be taken, blessed, broken (down), and shared. The greatest gift you can give someone is to live a life that mirrors the Gospels … reflecting God in all you do. The second greatest gift is to invite others to peer into that mirror. Okay, so that's a substantial start. Get the tools, pull together your blueprints, and start building your love for God's Word. 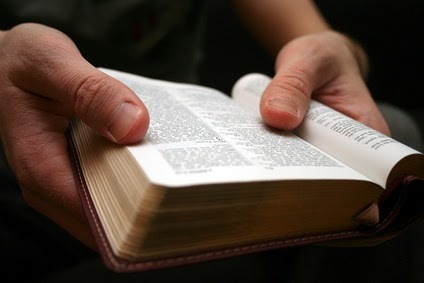 There are several ways to begin reading Scripture … these are just what I've found over the years to be the best, most realistic steps to begin and keep reading it daily. And don't just think that you have to 'study' every time you open the Bible. It's great if you set aside 30-45 minutes every day to begin studying, but that doesn't mean you can't flip the pages in other books like the Psalms, Proverbs, Sirach, Wisdom, Ecclesiastes, or in St. Paul's letters … you'll be blessed by all of them. I also strongly recommend the Book of James in the New Testament. Romans is a gorgeous and extraordinarily well-written book but is sometimes a little 'too deep' for the Biblical beginner. While Romans teaches us how to get to Heaven, James teaches us how to live on Earth (with people who might annoy you and try your patience). It's great. All I can tell you from my own experience is that the Word of God has changed my life. It has deepened my experience of the Eucharist, both at Mass and in Adoration. It has deepened my love for our Mother Mary and my gratitude for intercessory prayer and the communion of saints. It has deepened my love for the Church, the Papacy, and basic human dignity. It has fueled a fire within me for truth, the need to proclaim it, defend it, and uphold it – especially in this morally relative culture. I pray it will do the same for you.